I will confess that as of lately though, I haven’t been utilizing our cards as much as I was in the beginning. I used to read through them at bedtime, but now that Shaan is no longer napping, it feels like our bedtime routine has become so rushed as he typically is asleep by 7:30ish. 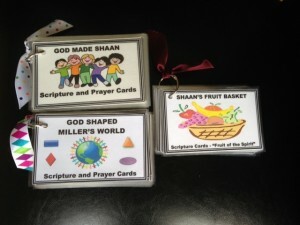 So, I loved reading through the “Tips On Memorizing Scripture With Children” article and getting the idea to put our cards at the dinner table as opposed to the bedside. We seem to be doing much better now that we are combining scripture memory with mealtime as opposed to bedtime when we are just “done” for the day.